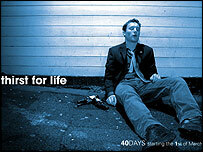 Lent begins on Wednesday and one charity is appealing for people to give up alcohol. The nation is always being asked to give up something, so why do it? There's more to life than drink is the message from the Thirst for Life campaign, a Christian group which is making its stand to coincide with the start of Lent. It wants people to go alcohol free for 40 days, the aim is to promote thought and discussion on how people use alcohol in their daily lives. For them it is the ideal time to launch such a campaign. Lent is the period leading up to Easter in the Christian calendar and is traditionally a period when followers give something up, to mark Jesus' 40 days in the wilderness. If you drink, would you give it up for Lent? But the nation is asked to give things up almost every other time of the year as well, ranging from Buy Nothing Day to TV Turnoff Week. But why are these days so popular and, apart from the health reasons associated with giving up things like smoking, why do people do it? For the organisations and charities that promote such days, the aim is to focus people's minds and make them take a good look at themselves and the world around them. "In this consumer society we don't have to work so hard for things so we push ourselves to feel more, leading to over-consumption of things like alcohol," says Emma Morrice, from Share Jesus International, the group behind Thirst for Life. "We just don't think about things in detail. We don't look at what effect alcohol has on us and our community. We are not condemning people, this is a positive campaign to promote thought and discussion." When it comes to the people who take part, it is about getting some control back in a world that is becoming increasingly complicated and busy, say some. "Most people lead frenetic lives and they just don't often have an opportunity to get off the treadmill and invest time in themselves or their relationships," says Cary Cooper, professor in psychology and health at Lancaster University. "These types of days provide that opportunity. It is about having a sense of control over events that people don't usually have all year round. Most people don't adhere to their resolutions for long, but I think it is a healthy thing to try." Control is also one of the primary reasons people decide to give up something off their own back, says Prof Cooper. Often they decided to go without something at critical times, for example after the break up of a relationship. They want to clear unnecessary clutter from their lives and get some sort of control back. But while people are often motivated by control, it is also about clearing their conscience and feeling like they have paid a price for good, says philosopher Julian Baggini. "Many people nowadays do feel their life is overloaded and giving something up is attractive because it means simplifying their lives in some way," he says. "I also think people have a puritanical streak and think if they give up what is bad for them they will be better and purer. "Essentially people want to actually feel they have done a good thing, they want to pay a price - like going without something or donating money - as it proves they have been good. "They are cynical about win, win situations where they can do good and it is also obviously good for them. This is somehow seen as less virtuous but that's totally bogus." The gains people get from giving something up are usually psychological, be it a sense of control over their lives or knowing they have helped someone else. It makes them feel better and there is nothing wrong with that, says Professor Cooper. "Psychological gain is the reason most people do good and thank God they do as we'd all be in trouble if they didn't. Everyone wins." But the gains are often short lived as people rarely stick to their resolutions for long. So does the act of giving something up actually put people back in control or just make them think they are? "It is something concrete and simple to do that makes people feel better momentarily," says Mr Baggini. "But in reality improving your life takes much more than just a quick fix." Although I am not a firm follower of the lent period, I do believe that by taking part in activities like this - lent or no lent- we put things into perspective. We learn to appreciate the fact that our lives do not and should not depend on such things -in this case alcohol- for us to have a good time and feel whole. I salute the 'Thirst for life' team for their courage to face one of societies greatest problems head on. There sure is MORE TO LIFE. Its's a nice idea but most people will realise at the end of the 40 days how dull and repressed life is without something to help let themselves go and they'll go out and get absolutely hammered to make up for it. If I can understand the good that may come out of looking at one's life and habits, I nevertheless resent the fact that it is yet again a way for religious groups to play the guilt factor and gain power over people. What a shame! I plan to give up giving up. I am fed such a constant barrage of don't to this, don't eat this, don't drink this that for lent I am plan to have most fantastic time and will repent afterwards. The important thing is not so much giving things up - although that can be a good form of self-discipline (or so those who manage it tell me). It is making space in your life to focus on what really matters. For me as a Christian, that includes understanding how my relationships with God and with other people fail, and how (with his help) they can be put right. Self-denial is putting other people first. All the religious groups could start by giving up on badgering the rest of us for Lent. If you want to be holier than thou, then keep it to yourselves. So Emma Morrice says she's not condeming anyone - yet in the same sentence says I don't think about my actions beacause I drink alcohol. This is unacceptably judgemental. I shall be giving up Jesus for Lent, both thought provking and discusional. Pschological gain is one thing. But how about psychological and enviromental gain? Boycott air travel and everyone wins. And not just for a month - for good. Give up?Take something on.Improve the life of someone else.Stop doing things for your benefit. We are on this earth to look after each other.Self-denial is good as it demonstrates self-control. But think about others during this season of Lent, and perhaps it will become a 'good' habit. Great idea. Gave up alcohol last year for lent and lost weight and felt much better about things. Also helps a lot as I am a student with a dissertation due and exams later in the year and can spend more time working and saving money for a change! !